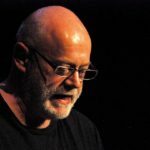 Ian Duhig has written seven books of poetry, most recently The Blind Roadmaker (Picador 2016), a Poetry Book Society Recommendation shortlisted for the Roehampton, Forward Best Collection and TS Eliot Prizes. A former homelessness worker, Duhig still works with socially excluded and immigrant groups, contributing to Comma’s ‘Refugee Tales’ series. He is a Fellow of the Royal Society of Literature and a Cholmondeley Award recipient, has won the Forward Best Poem Prize once and the National Poetry Competition twice.